For radio shock jock Nancy Neptune, life is just one big promotion. But when she's sent to work at a radio station near a polygamist compound in Utah, trouble comes in triplicate. In a land where one good wife deserves another, Nancy Neptune hooks up with a drag queen and a one-armed reporter to rescue a mentally challenged polygamist who is being abused by one of his nine mommies and neglected by the other eight. Jitters is narrated through a series of news reports with the characters reacting to the events of the day. Jitters features a cast of 15 actors who tell their stories in first person narratives. Don't miss this wacky ride through polygamist county, where the local radio station becomes part of every news story they broadcast! 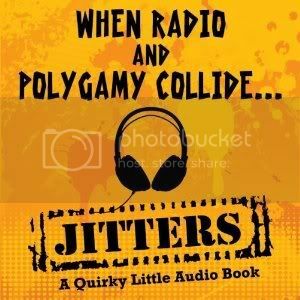 Jitters-A Quirky Little Audio Book is 6.5 hours long on 6 compact discs. Adele Park spent more than 20 years of her career working in television and radio as a reporter, news anchor, and on-air personality. During that time, Park earned several top journalism awards from The Associated Press, Colorado Broadcasters Association, and Utah Broadcasters Association. Park has also worked in the print media; her articles and photos have been published in a variety of magazines. In 2008, Park formed Straight to Audio Productions L.L.C. and opened a recording studio in St. George, Utah. I have to admit this is the very first audiobook I ever listened to completely. This audio book is so good and I liked that different voice actors would do the characters instead of just the 1 person who just reads the audio books. It was engaging and drew me in to the story. If you love audio books this is definitely one you should get. It is funny, very entartaining and captivating. I give this audio book a 5 out of 5 .